There are two types of people: Those who’ve heard of Peach, and those who haven’t. There’s no real difference between the two groups, though, because figuring out how to use the new social app for iOS is confounding even those who raced to reserve their username on launch day. If you’re tired of Facebook and want to get in on the ground floor of the next big thing, using Peach is easy—once you figure out how. Let’s get started. Think of Peach as a combination of Twitter and Slack, the popular chat and productivity app many companies now use to talk shop. You can broadcast thoughts to the world, like you do on Twitter (though Peach has no character limit), but the app also feels like a room scattered with GIFs and emojis, like your office Slack channel. Peach was created by Vine co-founder Dom Hoffman, but it’s not at all like the Twitter-owned video app, nor is it your standard social network. We’ll get to the differences in a minute. Finding friends on Peach needs improvement. 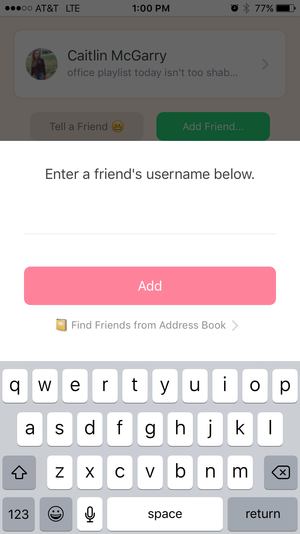 Peach has a huge problem right off the bat: The only way to find friends is by syncing your iPhone contact list. Because Peach is so new, offering Twitter and Facebook integration would broaden the pool of people to add on the app, which would keep everyone coming back for more. Right now, only a handful of people I know are using Peach, so checking my stream is a little discouraging. The user interface is a little strange—your stream lists your friends and lets you know if they have a new post, but you have to tap on their name to see it. It’s like if your Facebook News Feed consisted of your entire friends list, and you had to tap on each name to see their Timeline. Hopefully Peach makes this more manageable. 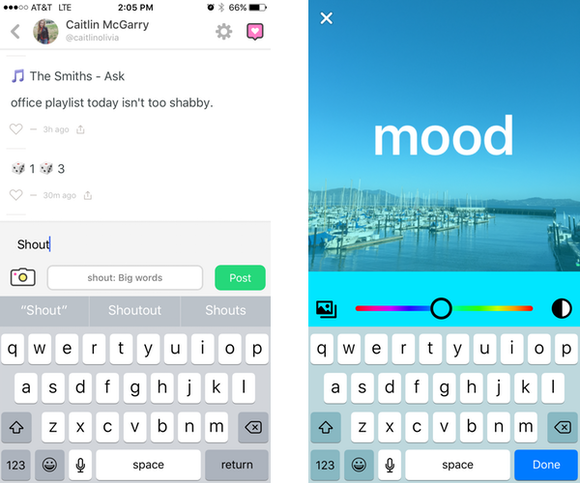 You can search for people by username, if you happen to know it, sort of like Snapchat. But you can’t follow people you don’t know—you have to wait for them to accept your friend request before you can view their posts. The best part about Peach is what you post and how. The app uses what it calls “magic words,” which are shortcuts you enter in the text box. Type in “battery” to post your phone’s battery life percentage. “Draw” unlocks a sketchpad so you can use your finger to write or create a quick illustration. “Events” lets you access your calendar and post what you have on deck for the day. Type in “GIF” to search for the Beyoncé GIF from Giphy that really captures your spirit. Add your current location by typing “here,” your step count for the day with “move,” the time of day with “time,” and the weather with, of course, “weather.” When you type in “song,” Peach taps your microphone to pick up what you’re listening to, just like Shazam. Friends can tap on the song to open it in Apple Music or Spotify, which is incredibly cool. “Rate” lets you give a star rating (out of 5) to anything you’d like. One of my favorite magic words is “shout,” which lets you add giant text over a plain background or a photo from your camera roll. Make graphics instead of crafting a 140-character thought. Other magic words include: “goodmorning,” “goodnight,” “safari” (which just opens your Safari browser, so not that useful), “dice,” “date,” “movie,” “tv,” and “game.” Peach is going to add more magic words in future updates. If you don’t know where to start, tap the lightbulb to the left of the text box. Peach will pop up prompts to answer, like “What’s the best thing about winter?” (my suggested answer: “Nothing, what is wrong with you”), or “A picture of yourself as a baby,” which is a perfect #TBT prompt. Magic words give your posts a little extra oomph, and Peach has a few camera tricks to do the same for your photos and videos. First, choose between your front-facing and rear-facing cameras, then you can either shoot a straightforward photo or video, or you can make things a little more interesting. I plan to throw cake at Susie Ochs daily. When you tap the infinity symbol to the far left of the camera button, Peach transforms into something like Instagram’s Boomerang by shooting a 4-second video that then endlessly loops back and forth. Tapping the square grid to the right of the infinity icon lets you shoot four photos and create a collage, with a handy 3-second timer that flashes to let you know when Peach is about to snap the next photo. This feature is tailor-made for selfies. It’s simple. It’s easy. It’s fun. It’s more lightweight than video apps, which require effort and something of interest happening around you, and it’s more public than a messaging app (but not that public—Peach lacks web profiles and none of your posts are searchable). 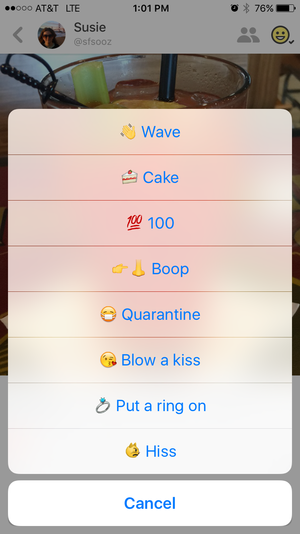 There’s even something akin to Facebook’s poke feature, but instead of poking your friends, you can wave at them, boop them on the nose, or throw cake at them. Yes, it’s silly, but so many social networks take themselves too seriously with manifestos and lofty goals. Peach is fun. It’s hard to tell which social apps will stick around (Snapchat and Periscope) and which will lose steam as quickly as they burst on to the scene (Ello and Meerkat). Peach is currently No. 108 in the free section of the App Store, behind LinkedIn (No. 104) but ahead of Periscope (No. 118). It’s not a smash hit yet, but it injects some freshness into the stale social networking landscape.